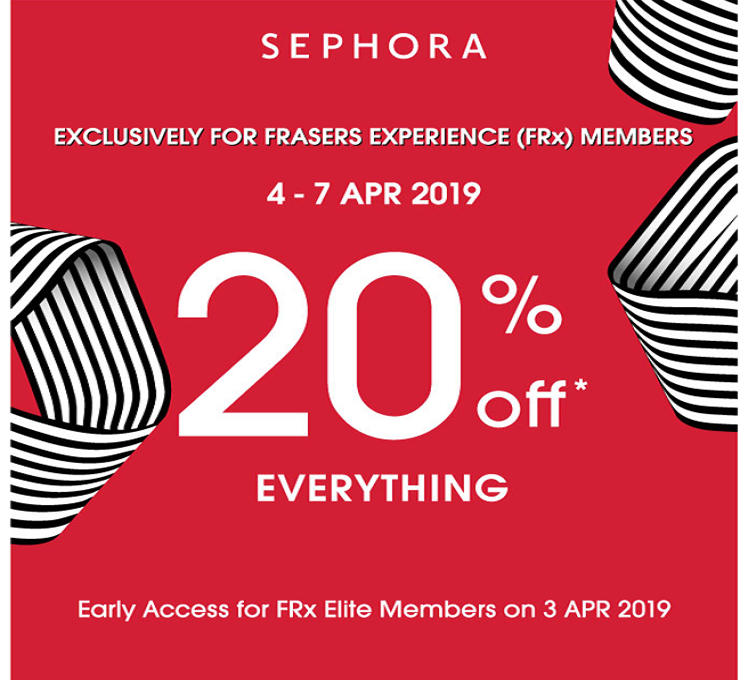 20% OFF EVERYTHING* at Sephora Causeway Point outlet from 4 to 7 Apr 2019. Exclusively for Sephora Gold and Black Beauty Pass members and Frasers Experience (FRx) Members. That's not all! FRx Elite Members can enjoy Early Access on 3 Apr 2019! *To enjoy this offer, simply flash the FRx App. Valid only at Sephora Causeway Point, #01-26/27. Promotion is not valid with other on-going promotions, privileges, discounts, vouchers/ coupons, redemptions, stamp cards, VIP/ member cards or vouchers purchases. Prices may be subject to prevailing GST. Check in-store for more details. Promotion is on while stocks last basis. All information is correct at the time of updating the website and tenant reserves the right to amend the Terms & Conditions without prior notice. Other terms & conditions may apply.